Environmental Protection Agency chief Scott Pruitt insisted he has "nothing to hide" and shifted blame for some of the agency's spending decisions to staffers during six hours of grilling on Capitol Hill Thursday. Asked how the White House viewed Pruitt's performance, one administration official told ABC News that he still "has no support in the building except from the president." Some Republicans defended Pruitt, saying that Democratic critics were trying to shoot the messenger and that he was a victim of "Washington politics" while Pruitt himself said some of the accusations of ethical misconduct were just untrue. Pruitt faced an array of questions about his decisions to roll back environmental policies since taking over the agency, whether he granted controversial raises to two of his aides and the cost of his security detail and travel. Pruitt had addressed some of the allegations and ongoing investigations in a Fox News interview that aired earlier this month but Thursday was the first time he was questioned about reports that he retaliated against EPA employees that expressed concerns about his spending at the agency as well as claims from an EPA whistleblower, described in a letter from Democrats, that his security detail exaggerated threats against him to justify increased spending and first-class seating on flights. Pruitt appeared before a House Energy and Commerce subcommittee Thursday morning and then before a House Appropriations subcommittee in the afternoon. Here are some highlights from the two hearings. A member of the House Appropriations subcommittee raised questions about one of Pruitt’s trips abroad, a recent visit to Morocco during which Pruitt promoted U.S. natural gas exports – typically within the Energy Department’s purview. “I can’t for the life of me imagine why an EPA administrator would be over there promoting energy sales,” Rep. Chellie Pingree, D-Maine, said. It wasn’t immediately clear which ambassador Pruitt was referring to. An initial agenda for the trip reviewed by ABC News included four redacted pages. The afternoon hearing began much in the same way as the Energy and Commerce subcommittee’s morning hearing ended, with Democratic ranking member Rep. Betty McCollum, D-Minn., holding Pruitt’s feet to the fire about security and travel expenditures. McCollum revealed that the committee reached out to the EPA’s inspector general ahead of the hearing and said the inspector general, Arthur Elkins, “disputed” some of Pruitt’s claims. Pruitt insisted the document was from the inspector general, and McCollum asked that the document be submitted for the hearing’s official record. When ABC News reached out to the inspector general’s office, a spokesperson confirmed Rep. McCollum’s assertion that Elkins disputed Pruitt’s claim. Pruitt shifted blame onto “career EPA officials” for erecting a private phone booth in the administrator’s office that cost more than $43,000. The EPA spent more than $43,000 to install a "secure phone booth" in Pruitt's office last year, according to agency documents obtained by American Oversight, a watchdog group founded by former Obama administration officials. In a letter to the GAO, the EPA also argued that spending on the booth did not need to comply with the appropriations law because it was not an “aesthetic improvement,” but an expense to facilitate agency business. A decision by EPA’s general counsel disagreed with that finding, saying that it was a functional improvement and not just aesthetic. 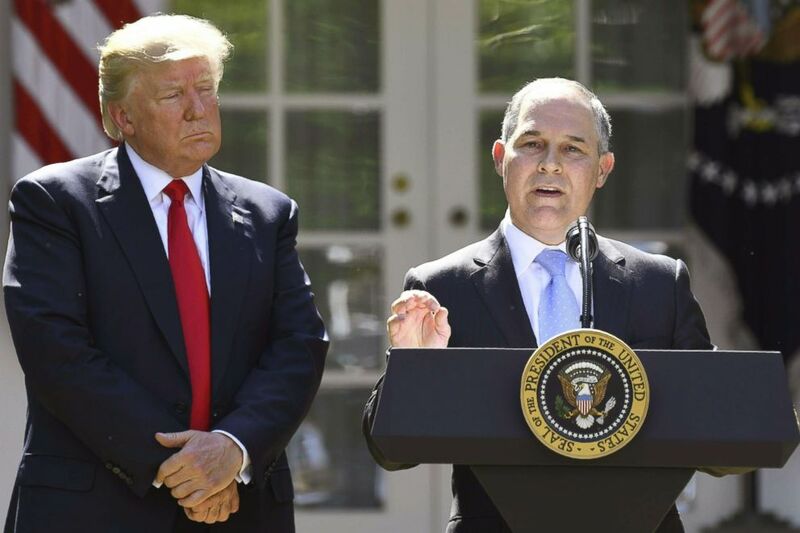 President Donald Trump listens while Environmental Protection Agency Administrator Scott Pruitt speaks after announcing the the withdrawal from the Paris accord in the Rose Garden of the White House, June 1, 2017. 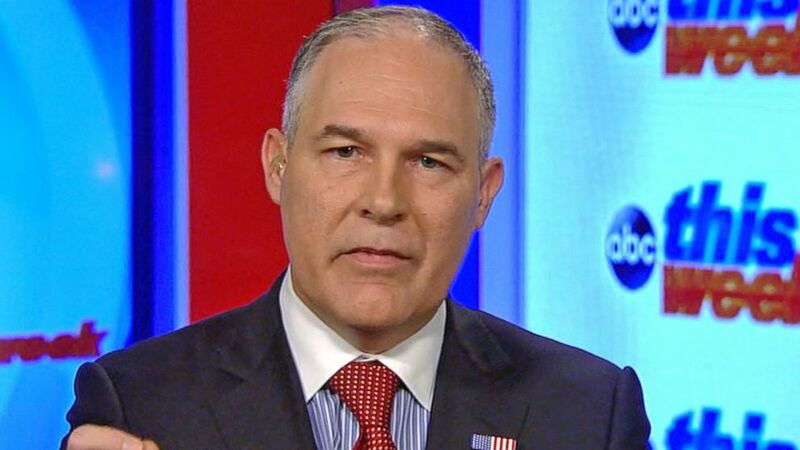 In an interview that aired on Fox News earlier this month, Pruitt said he didn't know anything about the raises and that he has taken action to reverse the decision. ABC News previously reported that two sources confirmed Pruitt pushed for the raises of two staffers but has not confirmed the amounts paid to these employees. The Energy and Commerce Committee's ranking member, Rep. Frank Pallone, D.N.J., called Pruitt’s conduct in office “an embarrassment” when referring to reports that Pruitt has acted in retaliation against EPA officials who disagreed with his agenda or questioned the legitimacy of threats against the administrator. 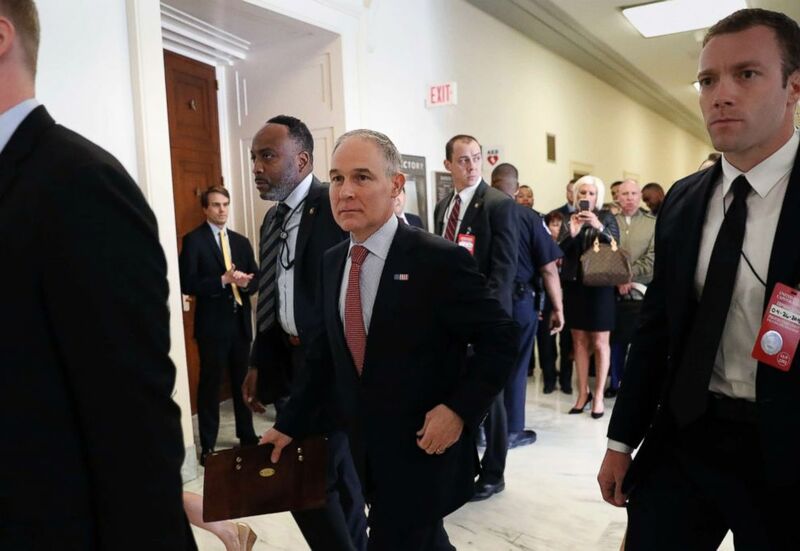 Environmental Protection Agency Administrator Scott Pruitt arrives to the House Energy and Commerce subcommittee hearing on Capitol Hill in Washington, April 26, 2018. But the committee’s vice chairman, Rep. Joe Barton. R-Texas, defended Pruitt, saying that he's a victim of "Washington politics," and Rep. David McKinley, R-W.Va., scolded his Democratic colleagues for "grandstanding" and engaging in “McCarthyism” by attacking Pruitt over news reports. In the second hearing of the day a Republican from West Virginia, Rep. Evan Jenkins, said that the EPA's decisions under Pruitt and President Donald Trump have brought his state "back to life." "When you don't like the message, you shoot the messenger," Jenkins said. Rep. Joe Barton says EPA head Scott Pruitt is the victim of "Washington politics."